OHRADIO is a new Jerusalem-based producer of music CD's and audio dramas. The first two releases are now available. These are The Mysterious Golem of Prague, a full length audio drama, starring Leonard Nimoy (Startrek's Mr. Spock), and PROPHECY, Music from the Kabbalah. The Mysterious Golem of Prague. This audio CD makes the imagination soar. Stunning sound effects, rich musical scoring and brilliant actors, starring Leonard Nimoy (Startrek's Mr. Spock), bring the Golem Story together as a spellbinding sound experience. This is a unique offering. Originally produced under the title The Mysterious Golem, this record was a successful cassette tape, but has not been marketed for ten years. It has now been digitally remastered with new sound effects and music scoring, to produce spine-tingling digital stereo. The results are truly amazing. The CD is accompanied by a four page booklet. Click here to hear the exerpt of the creation of the Golem from the Mysterious Golem of Prague CD with Real Audio. 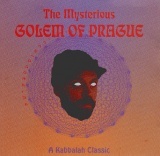 Purchase the Mysterious Golem of Prague CD for $22.00 including shipping worldwide. "You will meet a band pf prophets decending from the high place, and before them will be a lyre, a drum, a flute and a harp, and they will prophesy. And the spirit of Hashem will pass over you, and you will prophesy with them, and you will be turned into another man." The Biblical commentary, Metzudat David, explains that through these instruments the prophets elevated their souls to a state of ecstacy, making them ready to receive the Divine Presence. True prophesy is normally associated with the prophets of the Hebrew Bible. However the oral tradition teaches that there were more than two million Jewish prophets and that prophesy would return to Israel prior to the coming of the Messiah. The ten songs in this recording are ascribed to the Ten Sephirot, the Kabbalistic "Tree of Life". The Sephirot are the Divien Emanations by which the Eternal Light of G-d is revealed. The Kabbalists regard the Sephirot as a spiritual ladder by which one may ascend until they reach the highest level, Prophecy. This recording is electrifying Jewish musical experience, with compositions by the Baal Shem Tov, Rebbe Nachman of Breslov, the Baal HaTanya and other Chassidic Masters and Kabbalists, performed in a cornucopia of World Music styles. (Wait till you hear the Ojibwa Indian version of L'Chatchilla HaRibber). The album is composed and arranged by Mitch Clyman. Purchase the Prophecy CD for $22.00 including shipping worldwide. 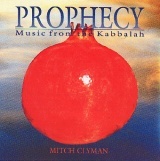 Click here to hear a heart-starting listener sample from the Prophecy CD with Real Audio.